After reading a few sad and grim books, I decided to change pace and read something wholesome. 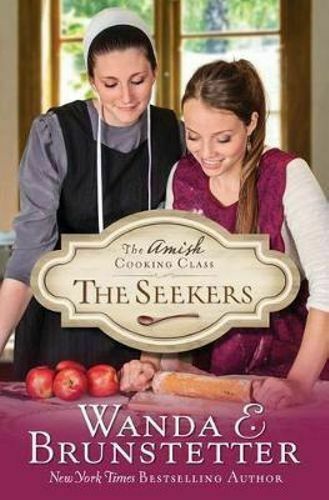 What could be more wholesome than a novel about an Amish cooking? I’ve always had a fascination with Amish people, so I was looking forward to this book. Wanda E. Brunstetter has written numerous novels about Amish people and has some Amish heritage. Heidi Troyer starts a beginners cooking class to share her love of cooking. She has five students who each have a different motivation for joining her class. The chapters alternate between the characters. The characters are Charlene, a young woman who wants to impress her future mother in law, Loretta, a widow who wants to cook wholesome meals for her children, Ron, a Vietnam veteran who has a hidden agenda and Eli, an Amish man wants to learn to cook after his wife died and Kendra, a pregnant young woman needing to fill in time. I really enjoyed the chapters when the cooking class was taking place. The recipes sounded delicious and I was thrilled that the recipes were included in the back of the book. I can’t wait to try them. I didn’t have a favourite character in this book. They all had some good points. I felt really sorry for some of the characters and there was one where I wanted a different ending. One thing that I found jarring with this book was the dialogue. I thought the characters sounded similar and a little too formal at times. I didn’t think the dialogue sounded natural. I was later surprised to learn that the book was written in 2017. I thought the book was from the 90s from the old-fashioned dialogue. I still enjoyed the book overall despite the dialogue. It’s the first book in series so I do want to read the next books to learn what happens next to some characters.